While on vacation in Costa Rica recently, I was having an interesting and lively conversation with a well-educated tour guide about the economics of the country. The guide thought that the economy of Costa Rica was very dependent on how the United States economy was performing. As I’ve discussed earlier in this blog, I’m an informed skeptic and questioned the validity of his comments. When I got home and back into the data geek mindset, I decided to look into his assertion by comparing the consumer price indices (CPI) of the two countries in more detail. The consumer price index is a decent indicator of how a country’s economy is performing since it shows changes in the prices consumers pay for goods and services over time. As discussed in more detail in a Forex Fraud article, the CPI is measuring price changes which are relevant to the consumer, and as such, the components of the goods that go into its creation are only those of immediate relevance to the consumer. A rising CPI indicates a period of inflation where prices are higher to buy a bag of rice for example. A declining CPI indicates prices are lower or going down. I wanted to find out if the data supported the claim of dependence on the U.S. economy and if so, when did it begin? To research the CPIs in Costa Rica and the U.S., I started mining the data I needed from the World Bank’s databases under the World Development Indicators section. (Note – I am not an economist and I’m aware that the CPI is not the only indicator of how economies are performing.) The World Bank data for each country dates from 1960-2014 and was last updated February 17, 2016 (approximately one month before this article was written). After downloading this raw data in CSV format, I navigated to the “Data” tab within the spreadsheet and then next to the row labeled “Consumer Price Index”. Here are more details by Focus Economics on how the Central Bank calculates the CPI in Costa Rica and how that may differ from how it’s calculated in the U.S.
Now is where the fun really begins – analyzing and adding value to the raw data. 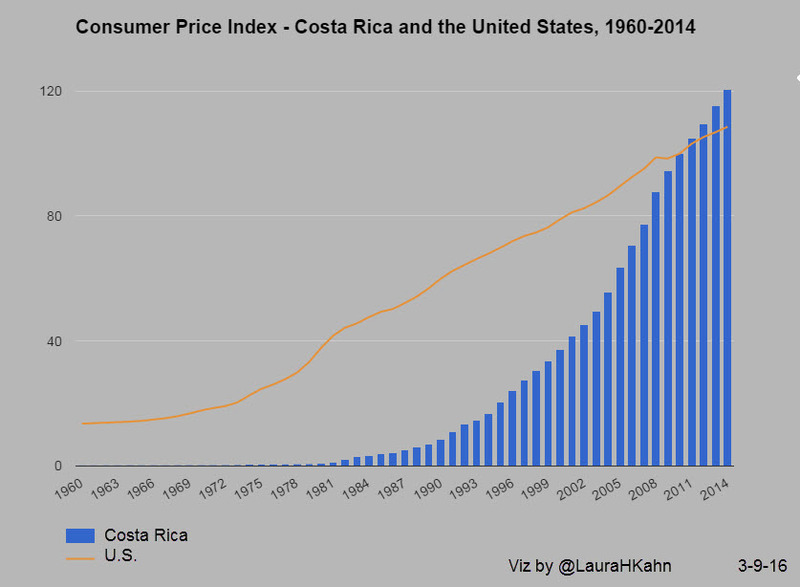 The first data point I notice is from 1960, the CPIs were 0.249 and 13.57 respectively for Costa Rica and the U.S. Prices in both countries have risen dramatically in the last 54 years, but more so in Costa Rica with an almost 100 times increase versus 87.5 times increase in the U.S. This analysis doesn’t answer our question of dependency so let’s dig a little deeper. Calculating the difference in the CPI between Costa Rica and the U.S. might help us see if the economy of Costa Rica is directly dependent on that of the U.S. and answer our earlier question. The CPI difference is 13.3 in 1960 and increases as expected incrementally over the years to 51.4 in 1991. It decreases minutely in 1992 and then increases slightly above the 1991 level in 1993-1994. In 1995 we see the decreasing trend continue until there is no difference in 2010. From 2011-2014 the CPI in Costa Rica is actually higher than that of the U.S. which might suggest a direct dependency. I think the answer to our question (and tour guide’s statement) is more complicated than this data alone can answer. There may be other reasons for this CPI trend such as the implementation of free trade agreements, foreign investment from across the world, or the more stable democracy they enjoy compared with their Latin American neighbors. Let me know if you have any questions or comments on this topic – ¡Pura Vida!